This article is adapted from one of the many articles that appeared in “Alresford Articles” Issue Number 4, 2014, published by the Alresford Historical and Literary Society (www.alresfordhistandlit.co.uk), from whom copies can be purchased. Some reminiscences about 1950’s Alresford, mainly from Pat Bentley, still living in Alresford. 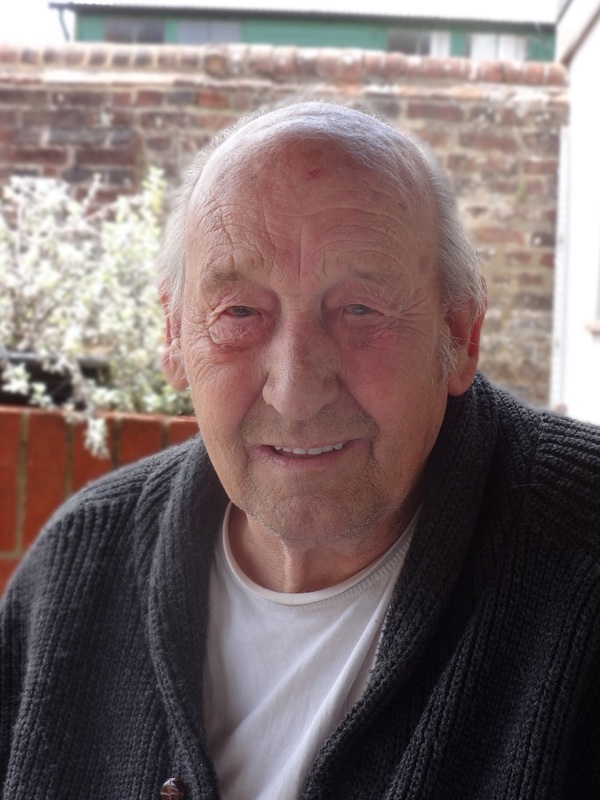 Pat Bentley was born in Alresford in 1939: the memories recalled here date from his childhood, mainly focused on his travels around town as a newspaper boy in the 1950’s. His Dad worked on the watercress beds in Itchen Stoke, owned by Mr Baker. The council didn’t really like him working as a paper boy aged 13, but somehow he got round that: he worked for Phair’s, the newsagent at the corner of Broad Street and East Street, later renamed Lawrence’s. On weekdays the papers arrived at Phair’s at around 6am, in a van from Winchester, and were sorted out by Mrs Taylor and Jean Cannings. Pat picked up the paper bike from St Joan’s at 7am, and started deliveries along East Street, Sun Lane and Edward Terrace, then back along Haig Road (not then properly surfaced) and Churchyard Cottages, getting back to Phair’s at 0745. More papers were collected and delivered to West Street, the Dean and Pound Hill: his friend John Newman did Broad Street and Grange Road. Pat arrived back at the top of Pound Hill at around 0850, just in time to collect his school friend Gerald Cornforth from number 42, Rose Cottage (Ref 1) and go over to school at Perin’s. In the evening there was another newspaper delivery, this time of the Echo and the Standard: these Pat collected from the 4.15pm train from Winchester – and took them for sorting to Dedman’s grocery shop at the corner of West Street and Jacklyn’s Lane. These he just delivered around the centre of the town. On Sundays the papers were sorted out at 7am in Wigmore’s on Broad Street (where Morgan’s Hardware is now): George Wigmore was a hairdresser, that also organised bus and coach trips – on one side, up the hill was Major’s, a toy and drapery store, and on the other Barker’s café – also with a drapery and gents outfitters. [Recently Nelly Shaw, of Bramble Hill, mentioned that she once worked in Major’s: Nelly is now aged 103, I think!] These papers were delivered with help from Gerald Cornforth: Pat did the same round as on weekdays to the east of the town, but after Churchyard Cottages went on up Station Road (not made up at that time), Station Approach and through the railway arch up Jacklyn’s Lane. In the 1950s the area around what is now called Nursery Road was a vegetable nursery, at the western end, run first by Mr Fairhead. Then the Fairheads started a builder’s yard at the corner of New Farm Road, and the nursery was run by Mr Wells. At the other end of what is now Nursery Road, opposite Langton’s farm (run by Mr Conway and his sons), the field there was known as the Alresford Fair field, where the annual Alresford Show was staged: Pat was in one of the local Scout packs, as most of the boys were in those days, and they sold the programmes. But they also tried to help get the vehicles out of the field after Show days, because it regularly flooded, and was very boggy. Over on Jacklyn’s Lane, opposite the nursery, Grange Road was unadopted, all mud and stones, with ashes put out by the residents to fill the holes: the same applied to Salisbury Road and Rosebery Road further up. Between Grange Road and the railway line, Pam Bailey comments that another field there, Mr Ellingham’s field, was where the annual Fun Fair was held – now the Fun Fair is usually erected on the Stratton Bates recreation ground, and a bungalow has been built on that part of the Ellingham field. During WWII, the Stratton Bates rec had been used as a rest area for Southampton and Portsmouth Fire Services personnel, with various Nissen Huts erected: Pam had friends whose families lived in these huts in the 1950s, until the time when Grange Road was resurfaced and most of the huts removed (Ref 2). One was left as a changing room facility for the sports field, which lasted a long time, into the 1990s! Going up the Jacklyn’s Lane hill, the town water-tower stood in a field on the right, slightly below the top, and behind where the Catholic Church and Carpenters now stand. 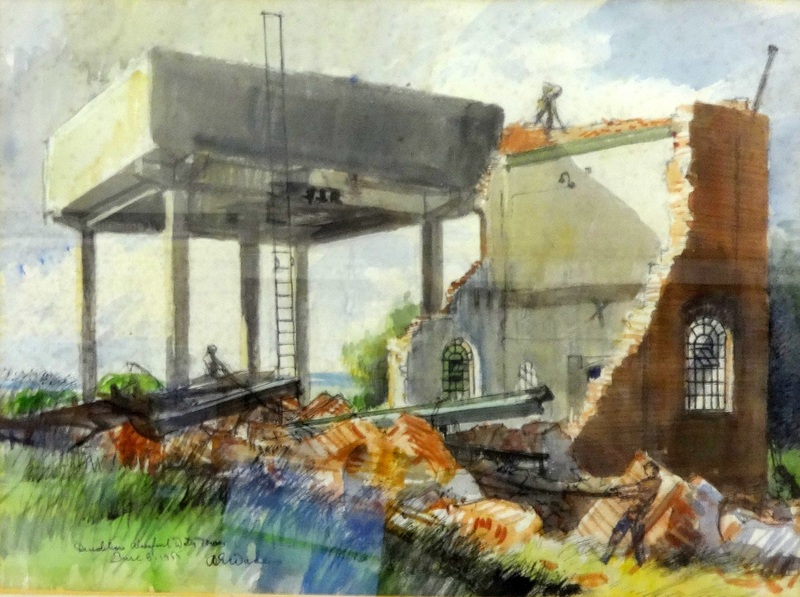 A painting showing the demolition of this water tower and pump house in June 1955, by A.E.Wade, is now on display in the Alresford library. The records there say that the town water supply came from this field for over 50 years, using a 120 foot deep five foot diameter shaft, and below that another 45 ft of an 18” borehole. A reservoir at ground level supplied water to most of the town: the water tower, with a top water level 16 feet above ground level (and quoted to be a concrete construction) enabled the water supplies to the higher parts of the town. Access was between the houses on Grange Road: now two appropriately named bungalows have sprung up on this site. Since 1955 the town water comes from Northington. The chicken farm, looking towards Alresford centre. The white roof near the Church is the cinema roof. Near to the top of the hill, before Salisbury Road, the next field contained a railway carriage, at the far corner. Pat had to walk along the path diagonally across the field up to the carriage to deliver the paper to the lady who lived there: and she had no curtains on the carriage windows. Occasionally this led to some slight embarrassment to the poor lad. The field to the West of the water tower was where Miss Toft had her stables and horse riding school. On the opposite side of the road, where the Bramble Hill bungalows now stand, there was a chicken farm. Moving on down the hill, there were 15 houses and bungalows in the area down to the Cricketer’s Pub, which included a schoolteacher – Mr Hedges – and the Chant family, who still live in Yettan, the house opposite what is now Linnets Road: there the three brothers had a car repair business. The three big houses on the left behind the Cricketer’s were named Fair View, Shepherd’s Down and Paddock Way, which were bought up and demolished to create the new housing estate. Dr Clark lived in one of these houses, and moved up the hill to the house on the corner of Rosebery Road: still present in Shepherd’s Down, Downlea was an earlier house built for the Hastead family (butchers) and accessed by a track down to Tichborne Down. Pat recalls four houses between the Cricketer’s and the field by the side of Tichborne Hospital (which is now Orchard Close) plus a track up the hill leading to Bennett’s Farm. The original site of the pub called “The Cricketer’s” was on the corner of Sun Lane, and became the Links Laundry: Whitehill Lane originally veered to the right (when approaching from Tichborne Down) at this laundry and went to the three original bungalows – on the southern side of the ‘new’ (1985) bypass to the town, now accessed via the underpass. The photo shows the original track of Whitehill Lane, as the initial work on the bypass cuts across the road. Earth banks were added later. Turning up Sun Lane, there was Mr Hazelgrove’s house (the butcher) and another large house where Dr Calder lived, on the site of what is now the Sun Hill housing estate. In wartime, the top of the hill (now the school playing field) had been the site for one of the searchlights on this side of town, looking for enemy aircraft, navigating at night using Alresford Pond as a landmark: Pam Bailey says another searchlight was on the Golf Course. Going over the top of the hill there was the Rectory, where Reverend Pearson lived – set well back from the road where some of the Beech Road houses are now. In the grounds of the Rectory, adjacent to Sun Lane, there was a swimming pool, and beside that there was a building that had also been used as a Scout hut. The Sun Hill Junior and Infants schools now occupy the area on the top of the hill, and they also had an open air swimming pool down near the bottom fence, up until the 1980s, but this was built presumably with the new school. Further down the hill, between where Chestnut Walk and Nursery Road is now, there was a half round-roofed Nissen hut, which acted as the local Army Cadet hut, run by Alf and Vic Merritt. Going down past Edward Terrace, the last house had a garage round the corner in Haig Road, and here Mr Molyneux, an AA patrolman, stored his motorbike and sidecar. Haig Road was not made up at this time: down there on the right was the British Legion Hall, and a printing works. On the corner of Sun Lane was the Sun Inn, owned and run by Cameron Black: of interest to Pat because they had Rock & Roll discos in there (in the evenings). But the main contact with the pub was his weekly visit from after collecting the paper money, mainly in pennies. These he swapped in the pub for larger denomination coins, as Cameron Black needed the change. Audrey Chalk at that time worked in the World Stores, run by Mr Blake: it was almost across the road from The Sun, at 17 East Street. Audrey well remembers phone-calls requesting them to take over further cheese supplies to The Sun, when extra lunchtime guests had arrived. Cameron Black would only have cheese cut from the centre of a whole cheese, so he was a difficult customer! 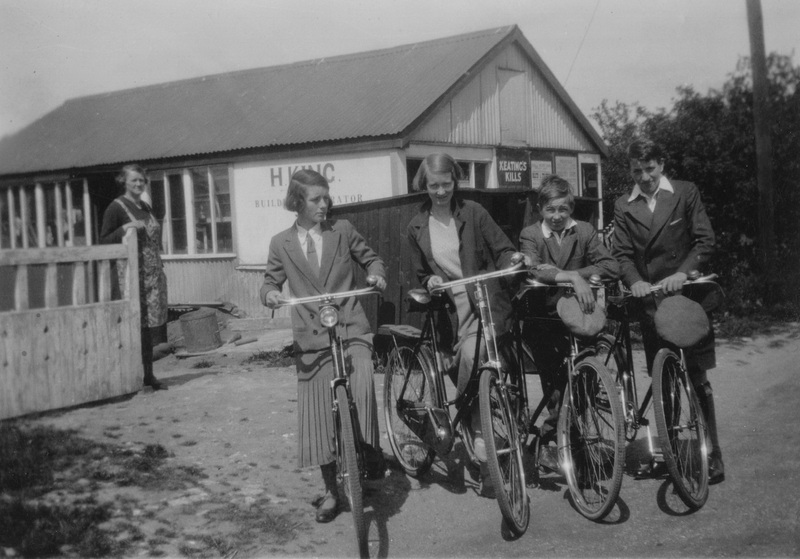 For Pat and his friends, such as Gerald Cornforth and Peter Chalk (later to be Audrey’s husband), bicycles were very important. Mr Andrews at 36 East Street, working from a shed accessed up Brandy Mount, mended bikes – cheaper than the main cycle shop, Turner’s. He did all the jobs needed despite only having one good arm. The cycle shop was in West Street, on the corner of Station Road, and was run by Mr Turner. He also lived on West Street – in number 38, Berukin, where the Dentist is now. Mr Turner employed young staff in his shop, so when he was not there, on a Saturday, the boys of the town used to get their bikes serviced free of charge. They then went regularly on trips, pedalling to Oxford or Bournemouth, Southampton or Portsmouth, in groups of 10 or 12 on their bikes. These were 1950s bikes, not modern lightweight ones. Audrey Chalk remembers Peter was keen on cycling trips to Portsmouth, where he would visit the theatre for a matinee performance, then cycle home. His preferred show was by the actress who was the model for Jane Gay in the famous ‘Just Jane’ strip cartoons in the Daily Mirror – quoted by Winston Churchill as Britain’s secret weapon in WWII. She was actually called Chrystabel Leighton-Porter: born in Eastleigh, her routine was much appreciated by sailors. It sounds like Audrey soon put a stop to that. Pat says he never went to those sort of shows. Pam Bailey also remembers bicycles as very important. When she was very young her mother worked in the Volunteer Arms on West Street, and took Pam into work with her. This pub was always full of cyclists from out of town: the main hobby for ordinary people in those days seemed to be touring on a bicycle, so the cycle shops, pubs and tea rooms did a lot of passing trade. Pam also remembers cycling to Petersfield, and walking to Winchester on a Saturday to support the Alresford Town football team when they were playing at Couch Green. Probably in later years than Pat Bentley, Pam also did the same paper round as Pat, on behalf of her brother, when he was unable to do it! 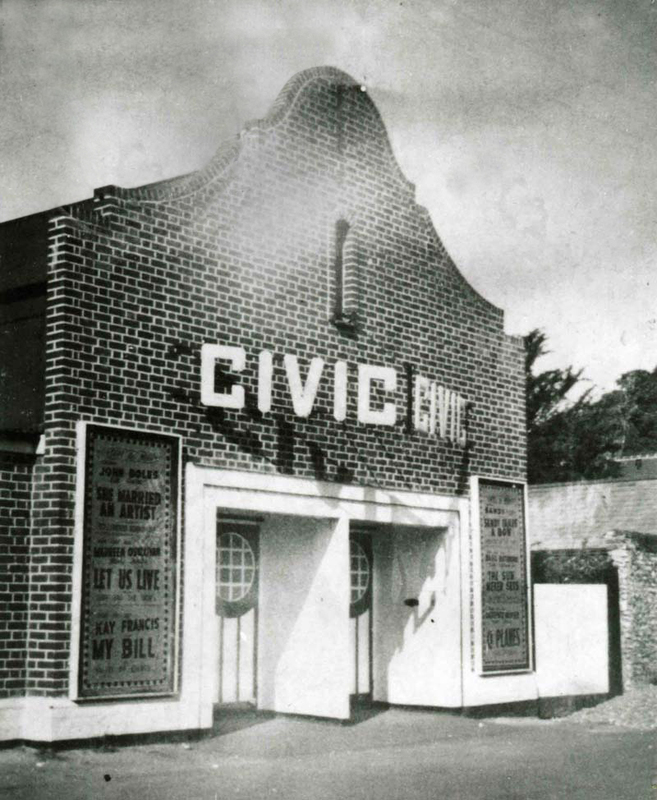 Further up Station Road was the Civic Cinema, which was basically an un-insulated tin shack that was an oven in Summer and a fridge in winter, but which had two stoves, which roasted those close to the stove – everyone else was chilly. Audrey Chalk was the usherette in the cinema, when the normal usherette – who happened to be Pete’s Aunt, Kathleen Smith – was on holiday, or absent. Pat Bentley also helped as a projectionist at the cinema, and because of his liking for Rock & Roll discovered that the large speakers behind the screen were very effective for playing his 78rpm records. The regular projectionist was Georgie Troke, sometimes helped by Pam Bailey’s brother. Pam recalls the audience stamping their feet when the film projection broke down. Entrance charges were three pence for seats at the front, and six pence at the back: there were three films per week, one of which was a matinee. The cinema was where Alders Court now stands, opposite the (then) Police Station. Between the Police Station and the Swan Hotel was a wooden building known as “The Monkey Hut”, which was almost three-cornered, and acted as a Church Hall, being used for Brownie and Girl Guide meetings, but also another place that Pat remembers as holding ‘Rock & Roll’ sessions for the younger townspeople! The origin of the name is unknown. In the area by the side of the cinema, down to the house known as Mulberries [demolished in 2014 to make way for more houses!] was the HCC lorry park and yard, and behind the public conveniences there were allotments reaching down to the houses in Station Approach: this area is now occupied by Bailey House and Crockford House. Pat lived at 25 Mill Hill, opposite the Town Mill originally: his Godmother Miss Chapman lived at the Old Post House in Broad Street. Miss Chapman became frail and needed more care, so they all moved to live together at Secundus on the Bishop’s Sutton road. The bungalow there was constructed from what might have been two Army huts side by side, so by boarding up doorways, Miss Chapman had her own privacy in one half of the building: Pat and his family named their other half of the bungalow “Dancaster”, and had a separate entrance on the side. There were several acres of land with Secundus, and Miss Chapman donated an acre of land, up to the railway bridge, to the Scouts for a headquarters hut, which was then brick built by Paines the builders, with help from Pat (who can still build a good wall if you need one). The building was situated on the right just before the railway bridge: it was later used as a rabbit farm, and then gradually developed into a bungalow home – called Railway View. Around five years ago this was replaced with a much larger house, called Acre Wood, so presumably any recognisable features of the Scout HQ building have disappeared! The picture shows the District Commissioner Rev. E.W. 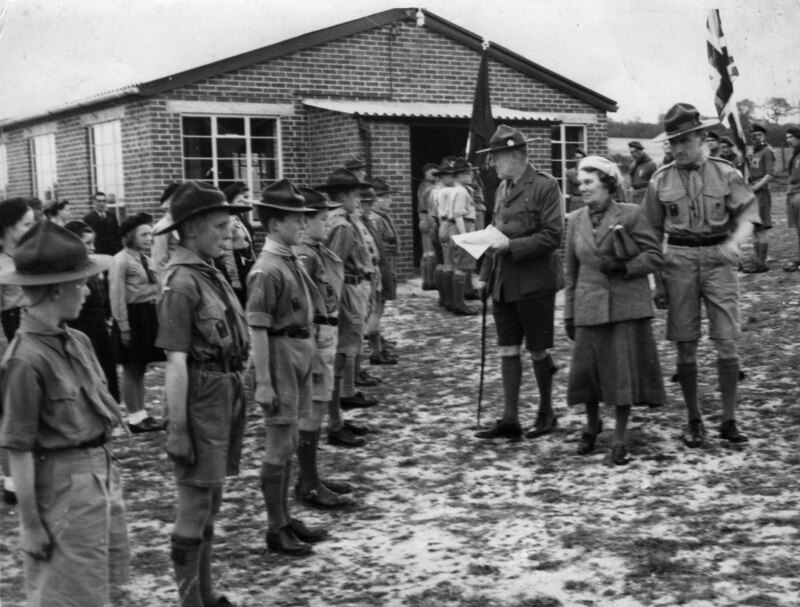 Selwyn inspecting the Scouts at the opening event, with some Guides also lined up behind. Miss Chapman is with the First Alresford troop Scoutmaster, Harold Shaw. On the right the Scouts there are from the Second Alresford (Handicapped) troop that was for boys and some older residents from the Tichborne Down House Hospital (Ref 3), which was a large community at that time. A big impression from Pat’s comments is that there were many many huts and buildings erected for out-of-school and community activities, for the kids, but also the young people of the town, in those days! Most of those listed so far were for boys, so I queried that. Pat says the girls had the Monkey Hut, and another guide hut, well separated from the boys huts, situated at the lower end of the Dean, where Huxley’s now stands. Up the road from there, he adds that there was Trucraft, a factory that made cinder blocks from the coal waste produced in the gasworks, which was further up the road. 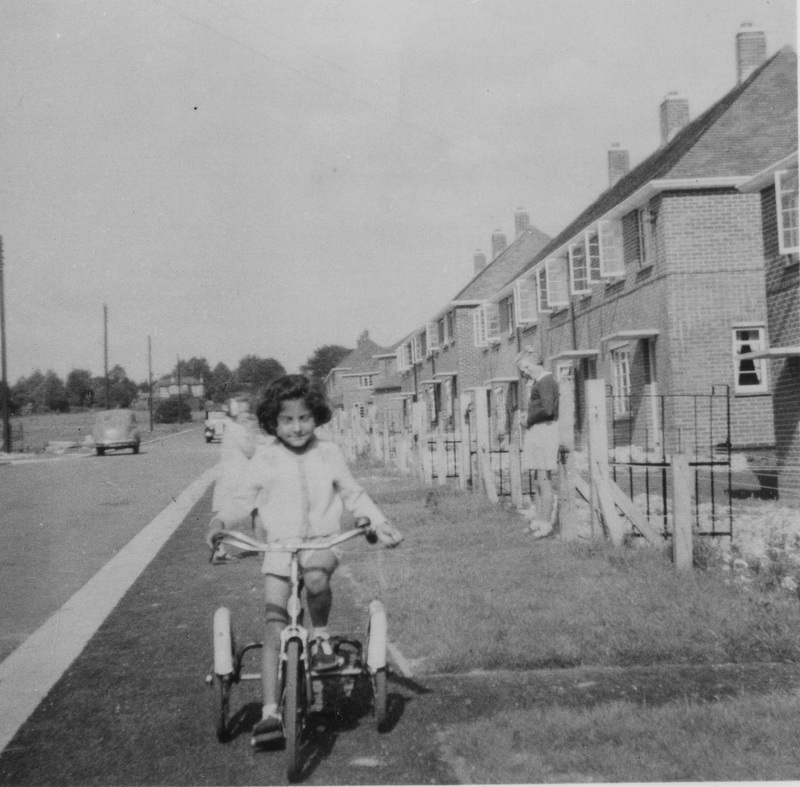 Pam Bailey remembers having an old pram that the children used, to collect twigs and broken branches from the woods – and it was also used to collect coke from the gasworks – to use on the fire at home. Allan Hunt, who was later to run a coach company from the Dean, used to drive the lorries for Trucraft. Further up the Dean, the ‘Old Forge Works’ in the 1950s made wrought iron gates and similar products – the business later moved to Ropley, near The Chequers Pub on the A31: maybe this building will not be a landmark much longer either, as it is unoccupied and derelict in 2014! For around the last ten years the Old Forge Works has been the home to Influx Measurements, who make glass tube variable area Rotameter flowmeters, normally seen as the anaesthetic gas flowmeters in TV Hospital dramas. Influx was an offshoot from the company Platon Flowmeters of Basingstoke, which is where your author worked: the Platon company was founded by Gilbert Platon, who retired to one of the flats in Ellingham Close. Influx Measurements is now located in one of the other factories in the Dean. Ref 1: “The bombing of Alresford”, Glenn Gilbertson, Alresford Articles 2, page 15. Ref 2: “The Stratton-Bates Legacy”, Brian Rothwell, Alresford Articles 4, page 7. 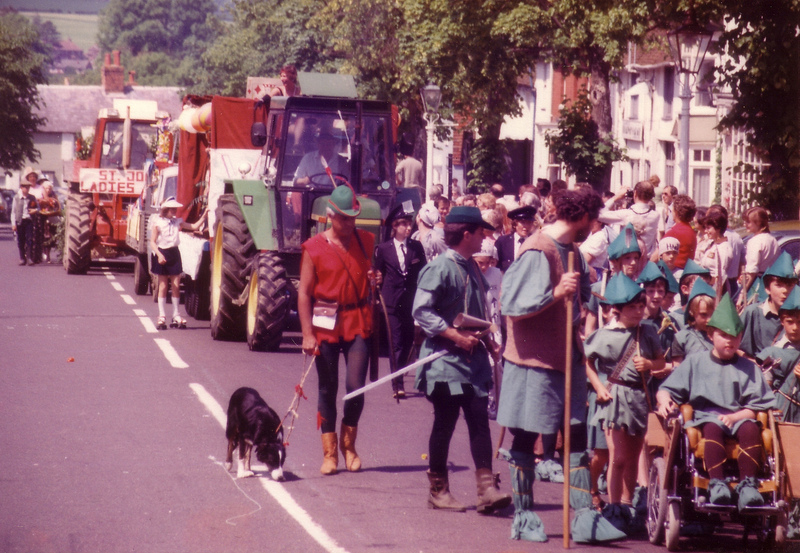 Ref 3: “100 Years of Scouting, in Alton, Alresford and surrounding villages” Nicola Guy & Sheila Woodman, 2001. The 1950s black+white photos are reproduced with permission from www.alresfordheritage.co.uk. This article relied heavily on the memories of Pat Bentley, who was then living in the Valdean mobile home park in the Dean. Pat, on his own since his wife died a few years ago, has now decided that it is time to do something different. So he has sold his Valdean home, and bought a true mobile home, plus a Smart car that he can tow behind. He is now off travelling, wherever the road takes him, and will probably spend some of his time with his brother in the East Midlands. I’m sure his old friends in Alresford will wish him Bon Voyage, and hope to see him back here occasionally. You’ll recognise the bright blue Smart car, it has “Smart arse” written across the boot! Regrettably Pat finally died in 2018, after living back in Alresford with his son for a year or so. 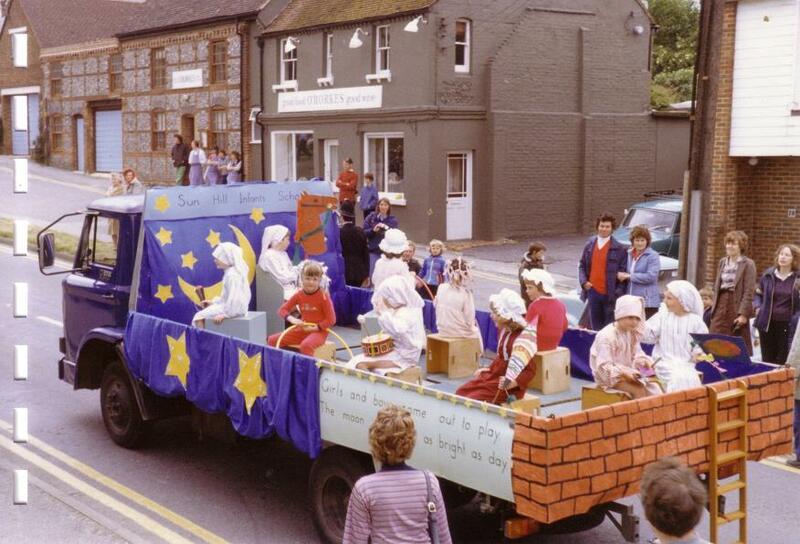 1955 was the year …………..
and all the little girls heard there was going to be a Brownie Pack starting in Alresford. I don’t know if we really knew what this was but our mothers quickly put names onto the list with the prospective ‘Brown Owl’ – a lady by the name of Mrs Mann. To start the Pack the oldest 12 girls could join and as I was 10yrs old I was granted a place. We were to be known as 1st Alresford Brownie Pack. 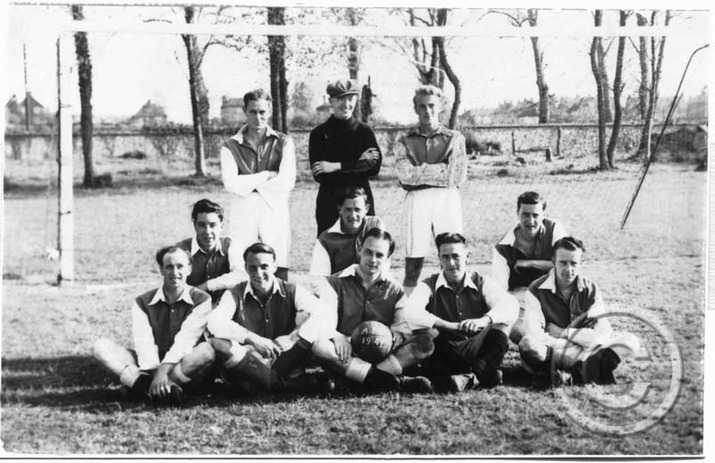 The pack was to be the first in Alresford to start after the war years, when the name had changed to 1st Bramdean, the village where they held their meetings. We met in The Dean School, Alresford on a Wednesday at 6.00pm. Each week we religiously took our subs together with a card and money to record how much Mum had paid towards the uniform – mine was £1.5.7d. During these first weeks, we learnt how to fold and tie our tie in readiness to wear with our new outfit, for the first time at our Promise ceremony. Learn how to wash up the tea things, learn the Brownie Promise, Law, and Fairy ring & Motto. Also to always wear a Brownie smile and do a good turn every day. On our Promise evening we stood in a Fairy Ring and in turn stood by the Brownie pool, looked into it to say the rhyme ‘twist me and turn me to show me the elf, I looked in the water and there saw myself’. After reciting the Brownie Promise and Law, the oval badge was pinned to our tie and Brown Owl shook our hand – using the special left hand to welcome us into the Guide movement. 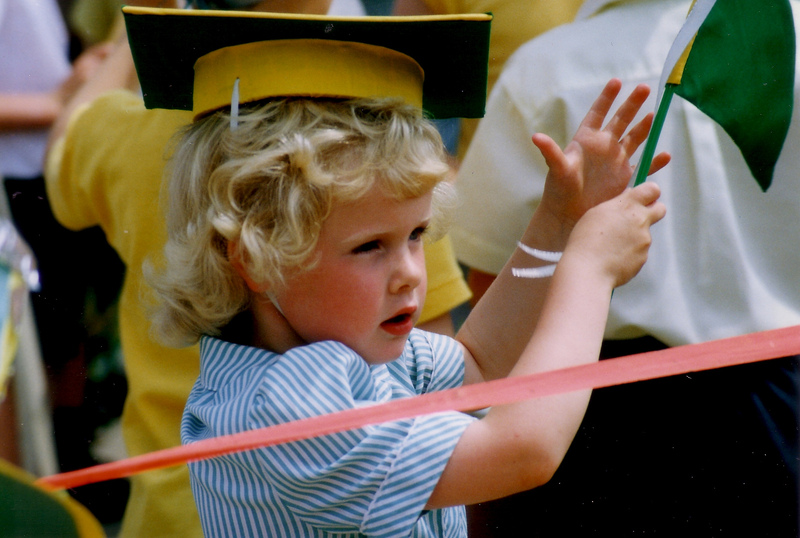 We learnt many things, amongst them knots which was my favourite as I nearly always won the game, and whether there was really a right and wrong way to fly the Union flag! 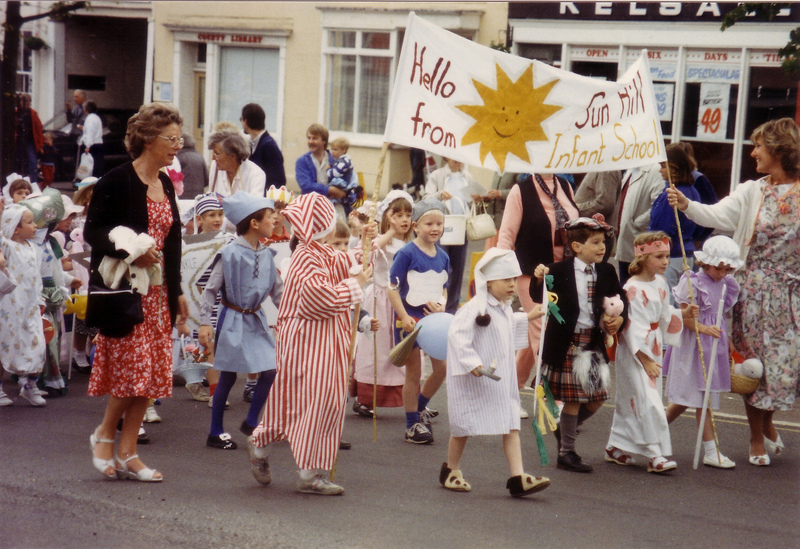 After only a year, I became 11yrs old and had to leave having had such fun – Brownie Revels hunting for paper rabbits, making a Squirrels tail to wear (can’t remember the reason), performing in a nativity play, and taking part in the carnival. 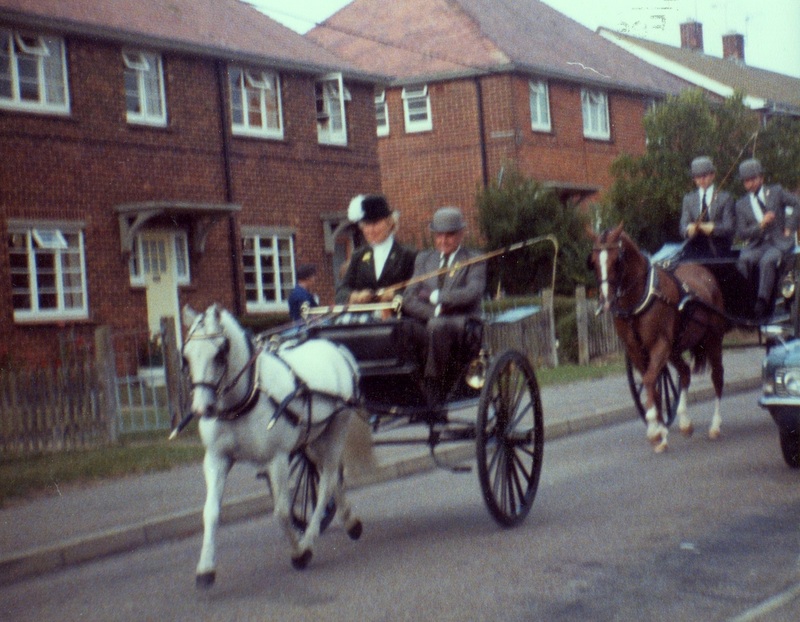 We were also taken to Winchester to learn how to cross a busy road. Now it was time to join the Guide Company, and look forward to more adventures. In January 2010 I retired as the Guider of this unit after 49 years with the same Brownie pack, meeting on the same night and at the same time every week..
Miss it – yes, but after seeing 445 Brownies I have lots of happy fun memories. Guiding is a lifelong activity that you never lose or give up. John Gilding, Alan Cliff, Dereck Chamberlain. 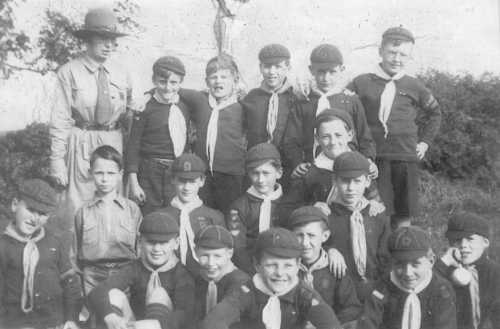 There was a thriving Boy Scouts and Cubs brigade in Alresford prior to WW2. 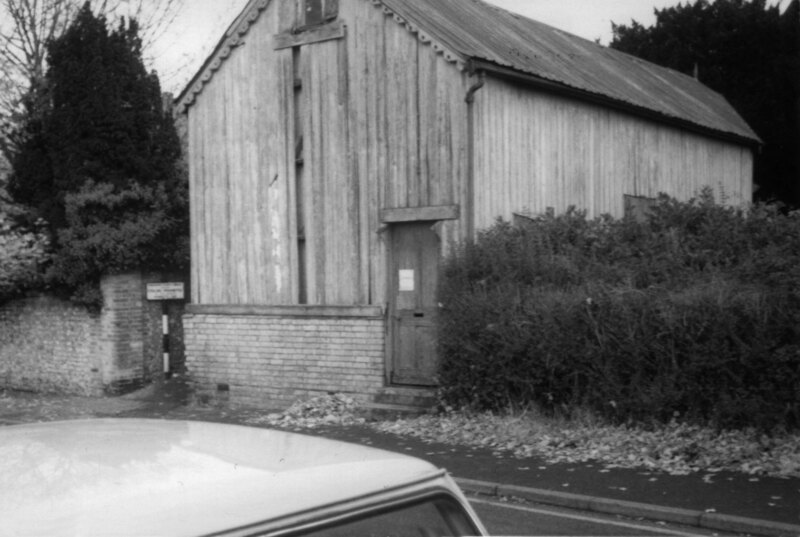 The Scout hut was quite a large building situated in the grounds of the Rectory in Sun Lane. There was also a swimming pool there, just a plain concrete affair about 60 feet square with a spring board and a high dive platform. The Rector, the Rev A.J. Robertson was the scout-master, a big bearded Scot, and when he dived in the pool we boys used to say: “There goes the Titanic being launched again”. His sister, Miss Irving Robertson, was the Cub mistress and we learned all our ‘dib dib dibs and dob dob dobs’ from her. Plus how to tie reef- and grannie-knots. This was all part of my formative years. Once a year we had a Scout Rally: for this we put on a swimming display, and after, on the rectory lawn, we staged short plays and sketches depicting Scout activities. This always brought in a good audience of Mums and Dads and other relatives anxious to see what there ‘little terrors’ got up to. We had many Summer camps during our school holidays. 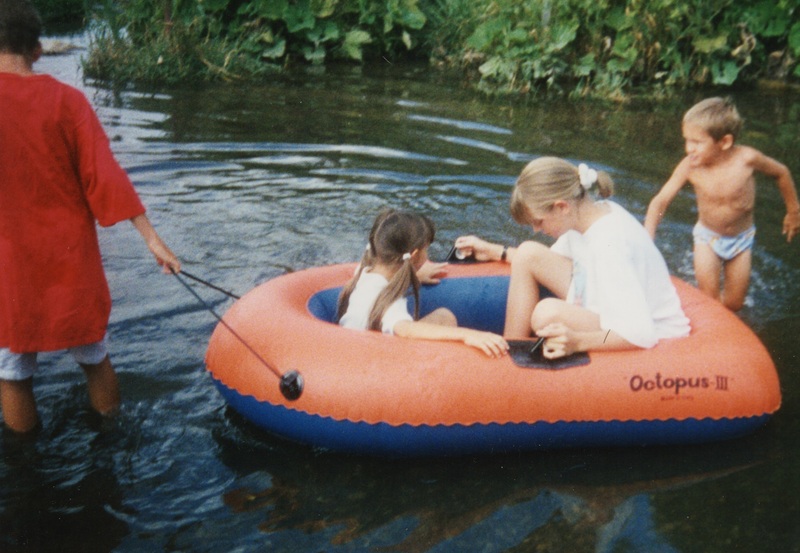 Locally, we went under canvas in Avington Park, and once or twice we went to Hayling Island. There were no blow-up beds then, we slept on just a ground-sheet with a blanket for cover, under bell tents, all with our feet to the middle. We cooked our food in Billy-cans over a camp fire, mostly this was baked beans, washed down with a tin mug of smoky tea. But we survived. The Rectory, Scout hut and pool are no longer there, they were demolished in the 1950’s to make way for housing, like many other sites around. Sad, that’s progress, but we have our memories to pass on to our Grand-children.